IZHEVSK, January 31. /ITAR-TASS/. US movie star, actor and martial artist Steven Seagal is ready to discuss a contract to promote Russia’s Kalashnikov Consortium, Rostec’s press office reported Friday. 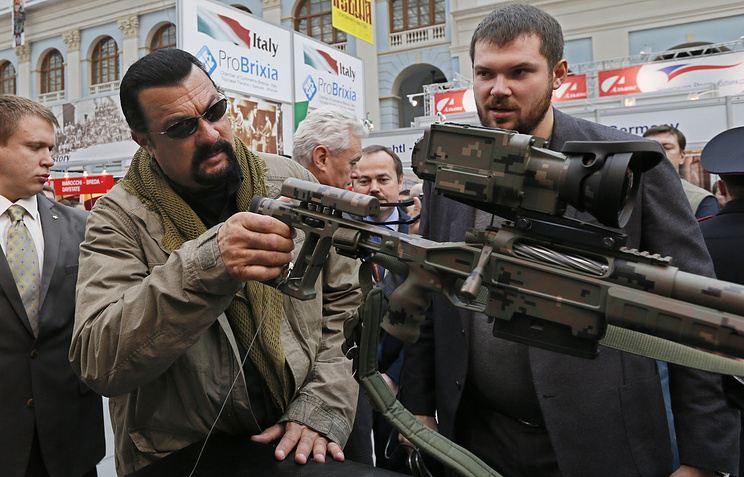 “Seagal has long been interested in Russian weapons and had the greatest respect for Mikhail Kalashnikov’s rifles,” the corporation added. As reported earlier, in January the company signed an exclusive contract to supply 80,000-200,000 weapons a year to the US and Canada. The Kalashnikov Consortium, part of the Rostec state corporation, is Russia’s largest producer of combat and sniper rifles, guided artillery shells, as well as a wide range of civil weapons like fowling pieces, sporting rifles, machines-tools and tools. The facility was founded in 1807. Kalashnikov now incorporates major state-run manufacturers of Russia’s rifled weapons industry - Izhmash and Izhevsk Mechanical Plant.